Update: “Infinite Content,” indeed. 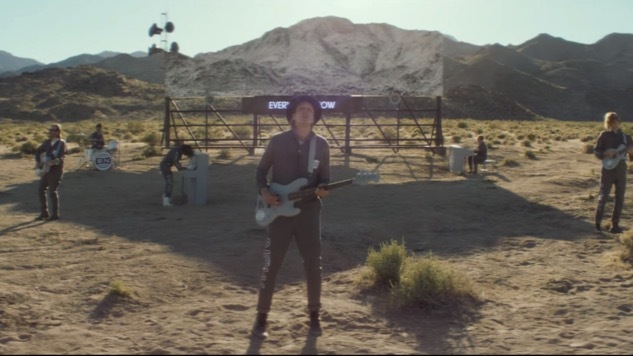 Shortly after announcing their album, Arcade Fire released the music video for their new single, “Everything Now.” The disco-infused song is in the same vein as 2013’s Reflektor, the band’s previous album. The music video follows the band performing their new track in the desert, which the band previously livestreamed on their website to tease the now-unveiled single. Arcade Fire also announced a massive North American 2017 tour. Tickets go on sale June 9 at 10 a.m. local time. Watch the video and take a look at the announced tour dates below. You can preorder Everything Now here. Original Story: Arcade Fire have announced that their fifth studio album, Everything Now, will be out July 28 on Columbia. It will feature the single, “Everything Now,” which is available now on Tidal and Spotify. Daft Punk’s Thomas Bangalter co-produced the album. The group also sold copies of the single on vinyl at Primavera Sound in Barcelona, Spain. The vinyl quickly sold out. Prior to the announcement, Arcade Fire teased fans via mysterious Twitter accounts, which you can read more about here. Listen to the new single via Tidal here. Also, check out our top 10 favorite Arcade Fire songs (circa 2013) here and find the Everything Now album art below.